The big names! The events! The networking! The debates! I'm still on a total high after attending this week's four-day World Conference of Science Journalists in Melbourne. It might sound a bit yawn-worthy to some of you, but this has been one of the biggest highlights of my professional life so far. I got to listen to, meet and chat to such luminaries as the eds-in-chief of Scientific American and Nature - John Rennie and Philip Campbell - Luna Media ed-in-chief Wilson da Silva, the ABC's brilliant Robyn Williams and Dr Norman Swan, and numerous other greats of the science journo world. And just as exhilarating was meeting other journos and freelancers like myself from all over the world. It's so great to hear about what other people are doing, to learn from their experiences and offer lessons from my own. I sure as hell learned heaps, and I hope I've helped convinced a few people to make the break into freelancing. It's a good life! The presentations included the ins-and-outs of reporting on public health issues, bias in science journals, the challenges of climate change reporting, an update on quantum computing (which I think I understood about 30% of) ... just to name a few things. I found my previous understanding of the concept of 'balance' was challenged and eventually transformed after hearing how damaging it has been for the media to keep giving air-time to the anti-climate change lobby. 'Balance' used to mean giving both the for and against views, but I've since realised that in the case of climate change, this perpetuates the impression that the scientific community is still in disagreement over whether climate change is real. In fact, there is enormous concensus amongst reputable scientists that climate change caused by human activity is real. The debate is now over what the results of this change will be. Anyway, won't bore you with more stuff, but I had a brilliant time, and I'm all fired up to tackle new and exciting things, so watch this space! 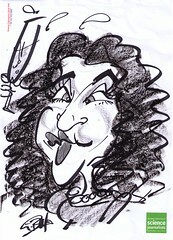 p.s If you're wondering about the attached image, it's my caricature drawn by artist Gavin Bell at one of the events. I was making all sorts of silly faces, fired by with several glasses of champagne. He obliged by drawing them. At least the wind didn't change. haha bibs i was getting into the bit about balance. sigh.oh well i'm left hanging i guess. on another note, how do you get your photos all nice and neat on the side of your post? mine seem to end up all over the place. second sigh. Still thinking seriously about it, not seeing my baby for 10 hours a day gets me down some days.